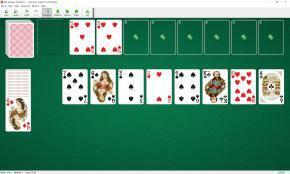 American Toad Solitaire uses 104 cards (2 decks). 20 cards are counted out from the deck of 104 cards. 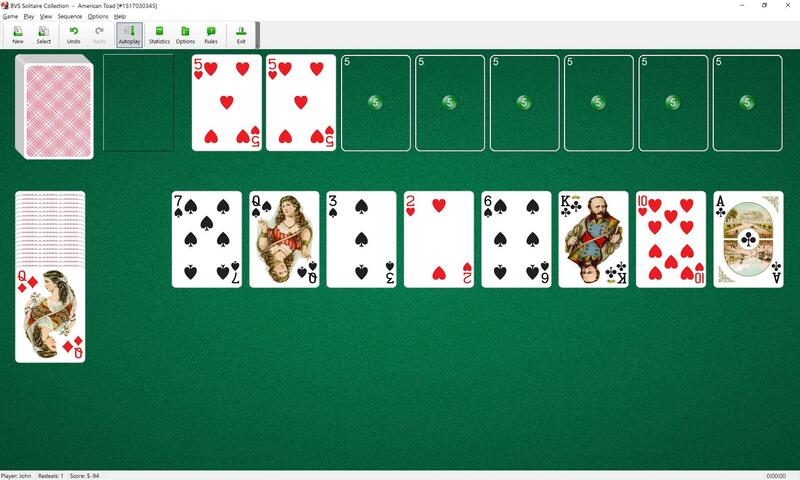 The top card is open. This is the reserve pile. The next 8 open cards are tableau piles. The next card is placed above. This will be the starter card of the foundations. The seven other cards of the same rank will be placed next to it during play as soon as they are available. To build the foundations up in suit until each pile contains thirteen cards. You can build tableaus down in suit. Only the top card of each tableau pile and the reserve pile is available for play on the foundations. One card or group of cards in the proper sequence can be moved to another tableau pile. When one of the tableaus is empty it immediately fills up with a card from reserve pile, if possible, then by any card. When you have made all the moves initially available, begin turning over cards from the stock pile to the waste pile. You can move cards from the stock pile to the tableau piles and to the foundations according to the rules above.